Apple puts your privacy way above its own short-term gain -- you can tell that's true because Ad Age calls the firm, "slow, cocky and downright stingy" because it won't share your private data with advertisers, which kind of makes them cry. You see, advertisers want your data. Like some twisted Santa, they want to watch where you go, what you do, what you like, not because they look forward to giving you charming gifts for being good, but in order to sell you more stuff. And Apple won't give them these insights. I don't see this as a bad thing. "The lack of data…is frustrating for marketers because these notoriously opaque giants sit atop incredible troves of information about what consumers actually buy and like, as well as who they are and where they live. One person familiar with the situation exec said Apple's refusal to share data makes it the best-looking girl at the party, forced to wear a bag over her head." (Ad Age). Apple knows a lot about us already: names and addresses, geographic locations and app and music-purchase histories, for example. So, do you want this info shared with advertisers? "Apple respects the privacy of our customers and the security of their information. Because of this, iAd allows users to control their own ad preferences so that their experience is on their own terms," Apple states. Apple's decision to keep your data private matches a recent string of privacy commitments from Apple, which has been as critical as it can be of the recent NSA-snooping revelations. "Apple has always placed a priority on protecting our customers’ personal data, and we don’t collect or maintain a mountain of personal details about our customers in the first place," it has said. I imagine most Apple users will see Apple's refusal to share what data it does keep with marketing firms as a good thing. Particularly in light of the fairly safe assumption that marketing firms are waving huge amounts of cash around in order to access this sort of information -- they want to connect with Apple's engaged online customers. To protect those customers, Ad Age's report means Apple's leaving money on the table, even if it means its iAds service isn't gaining the traction it could (at the cost of your privacy). Such a commitment probably seems a little anachronistic in the context of other online ads services, but it's surely interesting that Apple values your privacy above its own short term gain. (In contrast, Google is a little more open to sharing such information, the report reveals). Apple's privacy commitment was reflected recently when Apple began rejecting mobile applications from the App Store that retrieve the end user’s IDFA (Identifier for Advertisers), but don’t show any ads. 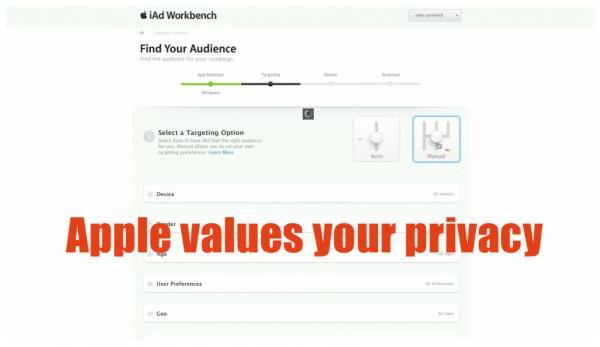 The IDFA tags were used by many analytics and optimization services, which Apple presumably saw as "eroding end-user privacy". With this in mind, perhaps privacy can join security and a lack of fragmentation on Apple's long list of unique mobile platform advantages?